I'm hosting Trivia Blast this and every Tuesday at Bierkeller in Taylor. It's on the corner of Allen and Goddard road. We start at 9 P.M. and give away actual cash money! Not only that, but it's free to join and drink discounts are offered to teams of 4 or more! It just so happens to be just around the corner from the old Magic McDonald's which I spent a few days at in my youth. This place may just be your new favorite place. Join us at 9 P.M. for the bar-wide toast (!) followed by me on Trivia! The acts will be scheduled between 3 areas at TV Lounge, including two outdoor spaces as well as the main discoteque indoors. OK Cool! doors open at 9pm on Sunday, May 29th and the dancing will extend into the morning. You are invited to let loose and get on the level at OK Cool! with some amazing friends, new and old! "Steve, The Amazing" brings his famous magic trickery back for another year. See you in Detroit this year? OK, cool! 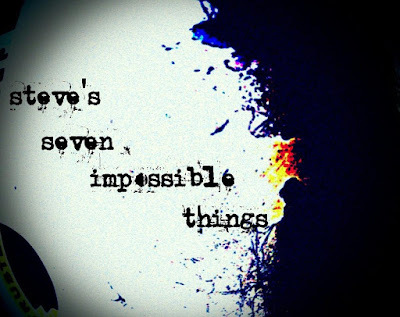 Right now until June 3rd we are running a contest to win a FREE TICKET to Steve's next show "The Seven Impossible Things!" Look for the post at the top of www.Facebook.com/SteveTheAmazing that talks about the contest. All you have to do is share the post and be a fan of the page to be entered into the contest. It may help if you leave a comment on the post as sometimes Facebook doesn't tell us if you've shared something. Trivia Tuesdays at Bierkeller in Taylor! I hope to see you there! Last week I gave out $300! New Magic and Mind Reading Show! Witness an intimate evening of Impossible Things! Magic, Mind Reading, Time Travel, and MORE! Ticket Presale Going on NOW!